Eczema treatments are vital in helping to keep a flare up at bay and in reducing inflammation and other symptoms of eczema. It is better to take precautions to reduce the likelihood of the symptoms worsening. There are so many things that can irritate eczema. This can make it feel impossible to look after your skin. Although there are many things that can potentially damage your skin, there are also many ways to reduce their impact. Here is more on the main triggers of eczema. When you have eczema, taking care of your skin is very important. It needs to be treated constantly, even when there are no signs of inflammation. You need to keep the skin as healthy as possible. Not all of the treatments can be used all the time. Some of them, when used long term, may cause further damage to the body and skin. With guidance from a doctor or dermatologist, they can be used safely. There is no treatment that has been proven to cure eczema. They may clear it for a while. The problem is that it can, and most probably will come back. Looking after your skin is important to stop that small dry patch spreading into a red, itchy major irritation. Some eczema treatments are used as maintenance. These help to maintain the condition of the skin. Some are used to treat the eczema when it is stubborn and severe. There are two stages of conventional treatment for eczema. First line treatment and second line treatment. The different methods tend to fall into one of the stages. First line eczema treatments are used, as the name suggests, first. They are used first because for most people they would help clear a flare up and help to maintain the skin. They are also very unlikely to cause any damage when used long term. Second line treatments are tried when first line treatments are unsuccessful. Also when eczema is stubborn and severe, especially when over a large area of the body. When someone is being treated with one of these they are monitored by a doctor or a specialist. They monitor how long the treatment is used for and look out for any side effects. If you would like to try a more natural way of managing your eczema, there are a few options. Dead Sea Salts are also reported to be very beneficial for the skin, and eczema. 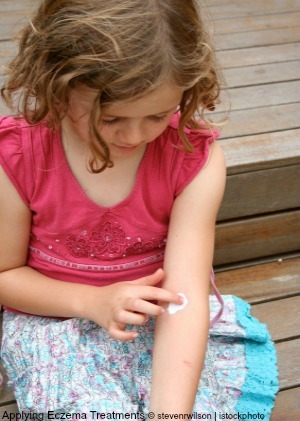 There is one thing that can be done that could help you to manage your eczema. Because eczema can be affected by allergens and irritants, it is a good idea to find out what these are. They could be a number of different substances. Some are thought to be triggers of eczema. There are also some common food allergies. The good news is that allergy tests can be done to work out what your allergens are. You will probably find that different treatments will work at different times. This could depend on your eczema's severity, the areas affected or the type of eczema that you have. It can take a while to work out the best eczema treatment for your skin. But it is well worth the effort. It will help with limiting flare ups and managing skin damage. You should combine that with limiting contact with anything that may be one of the triggers of your eczema. You will have happier, healthier skin.